NYU Shanghai Library’s Collection and Services will be closed from September 30 to October 8, in observance of National Holiday. For research assistance in the meantime, please email librarians in NYC, or use the chat widget on the library website. Happy National Holiday & Mid-Autumn Festival! The library is thrilled to announce our workshops for the Fall 2017 Semester, starting today! Please sign in through Orgsync to check each workshop for a detailed description and to RSVP – snacks will be provided in many of these workshops! Welcome and welcome back! At the start of the school year, I would like to introduce the exciting changes and additions to the library. Browsable DVD Collection: Our carefully curated DVD collection is now open for browsing during library hours in the Course Reserve Room. 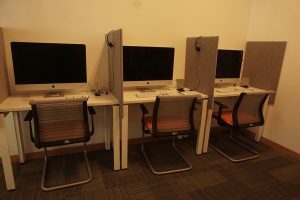 DVD Viewing Room: This new room is equipped with iMacs and Blueray players for you to use our DVD collection for leisure and research purposes. Curiosity Lab: The library will start to host our series of research and technology workshops in this new, collaborative teaching and learning space inside the library. Expanded Chinese Language Leisure Collection: Through a collaboration with the Pudong Public Library, we now have 500 new leisure titles ready for circulating. Each year, we will bring in new titles to the collection. I welcome you to visit us to check out the new spaces and collections. Hope the changes will further enrich your teaching and learning experience at NYUSH.